On February 11, the Project FINE Board of Directors hosted its “Annual Report to the Community” at the Saint Mary’s University Toner Center. This event is a celebration of the organization’s activities and accomplishments during the previous year and a time to thank the many partners, stakeholders, staff and volunteers who help Project FINE make a positive impact in our community. Each year, Project FINE recognizes an exceptional partner with the Partners Award. For 2013, we are pleased to honor Merchants Bank with this award. 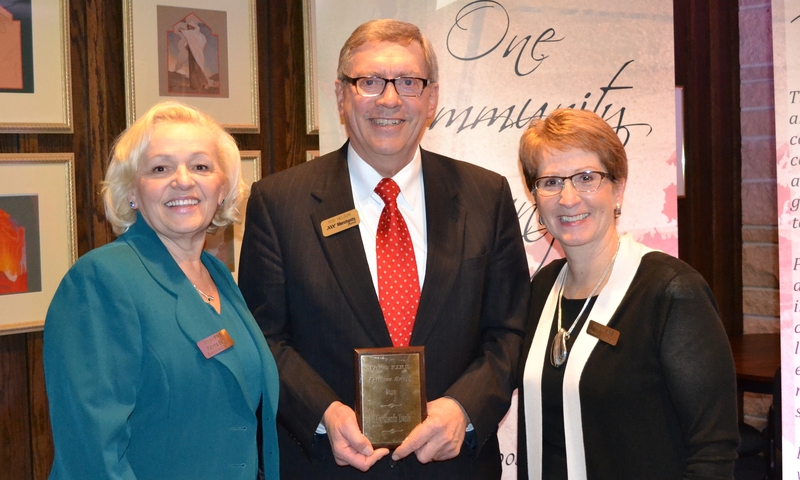 Pictured are Fatima Said, Project FINE Executive Director; Rod Nelson, Merchants Bank President and CEO; and Dr. Connie J. Gores, Project FINE 2013 Board President. Merchants Bank has been an exceptional partner to Project FINE for many years. In 2013, they completed an organizational diversity assessment and collaborated with Project FINE to provide diversity training for bank staff. Merchants Bank also offered a series of banking education sessions for refugees and immigrants on home ownership and refinancing and they continue their commitment to serving diverse populations by providing interpreters for their non-English speaking bank clients. As a result of this education and outreach, four newcomer families purchased a home through Merchants Bank in 2013 and countless others opened accounts. Project FINE would like to thank the leadership and staff at Merchants Bank for their commitment to creating an inclusive environment and meeting the banking needs of newcomers in our community. We are proud to partner with Merchants Bank and over 60 other community businesses, organizations and service providers to build a respectful and sensitive community. This entry was posted in Current News and tagged Community, Merchants Bank, nonprofit support. Bookmark the permalink.